What exactly should be on my credit report? Your credit report contains personal data, employment information, your credit history, public records information, and inquiries. Personal data includes your name, address, previous addresses, Social Security number, marital status and date of birth. Employment information includes present and previous employment. Most of the information on your credit report is your credit history, which includes your account information, payment history to creditors, balances, credit limits, and data of this type. Negative information can remain in your credit file for over seven years according to paragraph 605 of the Federal Fair Credit Act. The credit bureaus state that positive information can remain in your credit file indefinitely. Just like negative information, positive information also comes off in seven years. But the truth is, the credit bureaus retain all the information that they ever received about you. This unlimited time information is only available in very limited circumstances, and it is not worth worrying about. Public records information is obtained from the public records office. This is information that comes through the courts, including lawsuits, judgments, bankruptcy, liens, child support delinquencies and items of this nature. This type of information remains in your credit file for seven years. Chapter 7, 11, and 12 bankruptcies remain for ten years. A criminal record is public records information as well. The credit bureaus do not report criminal records to creditors. Employers are more interested in a criminal record. Criminal records do not take much effort to obtain. Inquiries include companies, usually creditors -- sometimes employers and insurance companies, who requested a copy of your credit report during the previous two years. Every time you apply for credit, you will add an inquiry to your credit report. It is my understanding that you can shop around for a home loan or a car loan and have a certain number of inquiries on your report without your score falling. You still should try to minimize your inquiries whenever possible. Creditors do frown on what may look like desperation, and these inquiries can affect your credit rating. There are other business inquiries that are not reported to companies requesting your credit file. The majority of these businesses are credit grantors trying to sell you credit. These are promotional inquiries and do not hurt your credit file - we're talking about some of the businesses that send you all the junk mail. As you can see, there is more in your credit report than your credit history. If you have seen the statistics of some of the surveys on the accuracy of consumer credit reports, you know that the three major credit bureaus receive several hundred thousand complaints each month because of incorrect and out-of-date information. I believe that all consuming American adults should obtain a copy of their credit report to verify accuracy, even if they do not use credit. Your credit report could be merged or have false information on it. It is a slim possibility, but you could be a fraud victim. Your credit report is a part of your personal profile. Your current or prospective employer might want to see your credit report. A good credit report will help you obtain all types of loans. Consumers with bad credit ratings are often the ones with the most errors in their credit file. The credit bureaus are not affiliated with our Federal government, but the Federal Government does regulate the credit bureaus. There are hundreds of credit bureaus, but we will concentrate on the three major credit bureaus: Experian (formerly known as TRW), Equifax, and Trans Union. All the hundreds of minor credit bureaus obtain their data from the big three. Credit bureaus are information clearing houses in the business of making money on information about you. They sell the information on you to lending institutions, insurance companies, renters, employers and to you. These are some of the same sources they use to obtain data about you. Whenever you fill out a credit application, the information is reported to the credit bureaus. If you close a credit card account, the credit card creditor will inform all nationwide credit bureaus that you closed the account. The credit bureaus will change your credit report to say "account closed by consumer." Your closed credit card account statement will stay in your credit file seven years from the day you closed the account. The credit bureaus do not have any authority to approve your loan application. The creditor uses the information supplied by the credit bureaus to make that decision. Obtaining a copy of your credit report does not take much effort. In the past, the big three credit bureaus changed addresses and had their phone numbers disconnected at their own discretion. This was not fair to the consumer, about whom they sell information. To request a copy by mail, call any of the big three and they will provide you with their current mailing address. If you have a Master Card, Visa or AMEX you can obtain a copy over the phone or Internet. The maximum cost is $8.00 for each credit report. In a few states, your report will cost less than $8.00. When you call the toll-free number, you will learn how much your credit report will cost or if you qualify for a free credit report. I remember when credit reports were two or three times that price. Our Federal government passed a law that regulates how much the credit bureaus can charge you for a copy of your credit report. It is my understanding that the big three will retain these toll-free numbers, even if their addresses change. You can get fax numbers as well, but Experian (TRW) likes to change theirs. You can make your own request form by typing it or simply printing your name, address, social security number, date of birth and proof of residence. Think carefully about the information you write on the request form for your credit report. Remember that any of your creditors can obtain this information. For example, if your telephone number is unlisted and you do not want collectors or creditors calling you, write no phone number available or N/A, even though the credit bureaus ask for your phone number, employer and proof of residence. These three are optional. Some consumers are unemployed and do not have a phone number. Credit bureaus ask for a copy of your driver's license or a utility stub to protect you from fraud -- and to find out where consumers who are hiding out from creditors and collectors live. I do not recommend that consumers hide from collectors or creditors, but that is not for me to decide. If you are hiding from creditors, your credit reports will show this. On your request form simply write, "I do not have a phone number, job or driver license and I live at granny's house." No matter what your personal financial condition is, you and every other consuming American have a right to obtain copies of your credit reports. At the same time, the credit bureaus have the responsibility of protecting every consuming American's credit file. If you have nothing to hide from the credit bureaus, then do not hide it. Your credit report will be processed as soon as the credit bureaus receive your request form along with your personal check or money order. They do not wait for your personal check to clear. By sending a money order (if you have debt collectors trying to collect a debt), you do not have to worry about your checking account information being passed on. Experian (formerly TRW) stopped providing one free credit report per year to anyone requesting it. You can still obtain a free copy of your credit report if you have been denied credit, employment, or insurance in the past 60 days. Under the new Fair Credit Report Act that went into law September 30, 1997, you can also obtain a free credit report if you are unemployed and plan to apply for a job within the next 60 days, if you receive government assistance, or if you think your report contains errors due to fraud. If you need to dispute a collection account before you send out the letters to the credit bureaus to gather more information on a specific collection account, try this one... Collection Dispute both of these forms have proven useful to us in the past. Under the 1997 Fair Credit Reporting Act, you can dispute inaccurate information at one credit bureau. If the information you disputed is inaccurate, the business supplying the information must notify all nationwide credit bureaus about the inaccurate information and have it corrected. Remember: I said the business supplying the information, not the credit bureaus. The big three credit bureaus do not share information -- the creditors supplying the information distribute it to each of the big three credit bureaus. If it is public records information you are disputing, then you must take up the dispute with each of the big three credit bureaus. If you're doing this yourself, I recommend that you obtain a copy of all three credit reports individually from Experian, Equifax and Trans Union. All three will include instructions on how to read your credit report and a request form for you to dispute incorrect and out-of-date information. Each credit bureau has its own name for the form used to dispute information. I will use the most common terminology and call it a research request form. Do not be surprised if you find errors on each credit report from the big three credit bureaus. After verifying or correcting your credit report from each of them, you should keep checking your credit reports from the big three regularly. Some consumers obtain copies semiannually, annually or every three years. I advise consumers to obtain a copy 180 days before applying for a major loan, and sometimes for employment or insurance purposes. Do not join a credit reporting service or fraud protection service. The banks and credit bureaus will offer free promotional services in order to entice the consumer into joining their services. You can take advantage of the free stuff, then cancel the service. After you obtain a copy of your credit report, you will need to know how to read it. No one knows your credit report better than you. You do not need to pay someone to do this. Credit reports are not that hard to comprehend. Credit bureaus have made them easier to understand. If you still have trouble comprehending or disputing information, call the credit bureau that produced your report. They are required by law to help you. Or have someone you trust, a friend or a family member help you. If your dispute is supported by evidence, send it in along with your research request form. If you send copies of any evidence along with your dispute, you can save a lot of trouble. Think, look, and dig for evidence. On your research request form and any additional information you send to the credit bureaus, remember to type or print neatly, make copies for yourself, and send by certified mail 'return receipt requested.' If the credit bureau discovers that the disputed information you returned to them on the research request form is inaccurate, incomplete or cannot be verified, it has to delete the disputed item or modify it to be accurate. Credit bureaus will check the information you are disputing at no cost to you. They have a 30 calendar-day time limit to resolve your dispute. If they do not settle your dispute in the required time limit, they must delete it from your credit file. You need to wait a few more days after the 30 calendar-day time limit for the mail to run. If you do not receive information about your dispute being investigated, then make a copy of your certified mail receipt and write a letter demanding that the disputed information be removed due to the 30 calendar-day time limit. If you provided additional information during your original 30-day time limit after initiating the dispute, the credit bureaus have 15 more days to settle. In the past, the credit bureaus had a bad reputation for handling disputed information. This is one of the reasons for the 1997 Fair Credit Reporting Act. Under this law, the credit bureaus will establish a better reputation and follow the laws that govern them. Credit bureaus cannot reinsert the deleted dispute into your credit file as they used to do in the past. If the party supplying the information shows proof that the deleted item is complete and accurate and you are notified, the disputed information can be reinserted into your credit file. Any time a dispute changes your credit report; the credit bureau must furnish you with an updated copy. If you cannot get your dispute corrected, you can add a hundred-word statement to your credit report. For several reasons, the hundred-word statement is not that beneficial. Anything could change. You're better off discussing the dispute with your potential creditor yourself, or including a statement along with any evidence on your personal loan application. Consumers will put statements in their credit files because of bankruptcy, divorce, and fraud. If you're still determined to insert a hundred-word statement into your credit file and you need help, the law requires the credit bureaus to assist you. Several creditors use a automated scoring system supplied by the credit bureaus. These creditors might not see your hundred-word statement or your actual credit file. The most popular scoring system used by the credit bureaus has ten different models for the same score or loan. You will be classified in one of the ten models. Each model has a different formula in order to classify you in the right model. The credit bureaus do not put everybody into the same group. For example, a consumer with an old bankruptcy but no other indication of risk in his credit file might merit a higher score than a consumer with no negative information in his credit file. 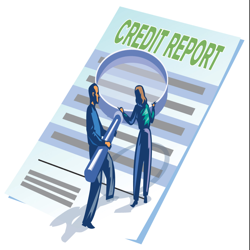 The majority of creditors still want to look at the actual credit report. If the credit bureaus determine your dispute is foolish or irrelevant, they can terminate your investigation. An example of something foolish would be to dispute everything on your credit report -- positive and negative information -- hoping to overload them with work and to get your credit file cleared because it would be too troublesome to check. An example of something irrelevant would be a dispute in which you did not write down all of the information required in order to investigate your dispute. If you're worried about your current or potential employer obtaining a copy of your credit report without your permission, that is 'past history' under the 1997 Fair Credit Reporting Act. Employers must get written authorization from you to obtain your credit or medical reports. The new law holds credit bureaus more accountable for the information they sell about you and has added more protection for your privacy. Under the new law, you can stop the credit bureaus from selling your name and address to inquiries from creditors such as those trying to sell you credit cards. The credit bureaus must provide a toll-free number solely for this purpose. You can contact the credit bureaus to remove your name and address from the big three's lists for unsolicited credit and insurance offers for two years. If you complete and return an "opt-out" form provided on request from the big three, you will be off these lists permanently.